Interest Payable is a liability account shown on a company’s balance sheetBalance SheetThe balance sheet is one of the three fundamental financial statements. These statements are key to both financial modeling and accounting. 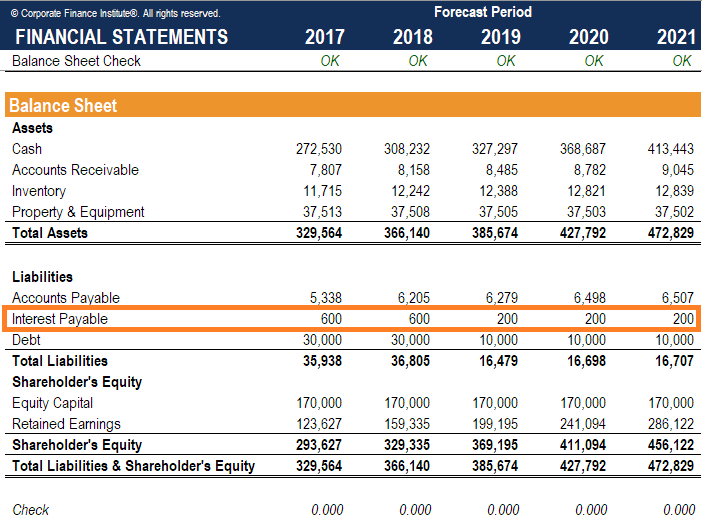 The balance sheet displays the company’s total assets, and how these assets are financed, through either debt or equity. Assets = Liabilities + Equity which represents the amount of interest expenseInterest ExpenseInterest expense arises out of a company that finances through debt or capital leases. Interest is found in the income statement, but can also be calculated through the debt schedule. The schedule should outline all the major pieces of debt a company has on its balance sheet, and calculate interest by multiplying the that has been accruedAccrualIn financial accounting or accrual accounting, accruals refer to the recording of revenues that a company may make, but it has yet to receive, or the expenses that it may incur on credit, but it has yet to pay. In simple terms, it is the adjustment of accumulated debts and credits. Such accounting practices, therefore, to date but has not been paid as of the date on the balance sheet. In short, it represents the amount of interest currently owed to lenders. Interest payable amounts are usually current liabilities and may also be referred to as accrued interest. The interest accounts can be seen in multiple scenarios, such as for bond instruments, lease agreements between two parties, or any note payable liabilities. Interest payable accounts are commonly seen in bond instruments because a company’s fiscal year endFiscal Year (FY)A fiscal year (FY) is a 12 month or 52 week period of time used by governments and businesses for accounting purposes to formulate annual financial reports. A Fiscal Year (FY) that does not necessarily follow the calendar year. It may be a period such as October 1, 2009 – September 30, 2010. may not coincide with the payment dates. For example, XYZ Company issued 12% bonds on January 1, 2017 for $860,652 that have a maturity value of $800,000. The yield is 10%, the bond matures on January 1, 2022, and interest is paid on January 1 of each year. The issuance of the bond is recorded in the bonds payable account. The 860,653 value means that this is a premium bond and the premium will be amortized over its life. The interest expense is the bond payable account multiplied by the interest rate. The payable is a temporary account that will be used because payments are due on January 1 of each year. And finally, there is a decrease in the bond payableAccountingOur Accounting guides and resources are designed as self-study guides to learn accounting and finance at your own pace. Browse hundreds of articles on important topics such as the income statement, balance sheet, cash flow statement, depreciation methods, how to link the 3 statements, debits & credits, journal entries account that represents the amortization of the premium. Finally, the payable account is removed because cash is paid out. This payment represents the coupon payment that is part of the bond. Interest payable accounts also play a role in note payable situations. For example, XYZ Company purchases a computer on January 1, 2016, paying $30,000 upfront in cash and with a $75,000 note due on January 1, 2019. The interest rate is 10% and is paid on January 1 of each year. The note payable is $56,349, which is equal to the present value of the $75,000 due on December 31, 2019. The present value can be calculated using MS Excel or a financial calculator. The interest for 2016 has been incurred but is paid on the following year on January 1, 2017, so it is recorded as a liability account in 2016. The account is then reduced to zero and paid out in cash. This has been a guide to understanding how interest can move between the income statement and balance sheet. CFI is the official provider of the global Financial Modeling & Valuation Analyst (FMVA)™FMVA™ CertificationThe Financial Modeling & Valueation Analyst (FMVA)™ accreditation is a global standard for financial analysts that covers finance, accounting, financial modeling, valuation, budgeting, forecasting, presentations, and strategy. certification program, designed to help anyone become a world-class financial analyst. Through financial modeling courses, training, and exercises, anyone in the world can become a great analyst.